You're considering a cost efficient QVC Diamonique ring to represent your impending nuptials. After all, it provides that big diamond look at a fraction of the real diamond price. However, there are few points to consider before you pull the trigger. 'Diamonique' is a diamond simulant branded by the shopping channel QVC. It is a cubic zirconia, commonly referred to as a 'CZ', which is the most popular of the diamond simulants. 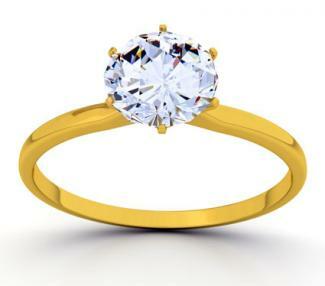 Buying a ring with a synthetic diamond, such as a Diamonique ring, would cost thousands of dollars less than buying a ring with a natural diamond of similar size. But, when you go this route, you are going against the tradition of a diamond engagement ring. There is a vast difference between a diamond and a CZ, even though they look similar, so consider your choice carefully. Bridal Ring Set: This 2.95 carat total weight bridal set features a 2.0 carat cushion cut (rounded rectangular shape) center-set CZ in a yellow gold. It comes with a wedding band. The bands of both rings are enhanced with .95 of a carat total weight of trillions (triangular cut) and round CZs. The center CZ has 100 facets, which will make it sparkle more than an average CZ that has 50-60 facets. The set retails for about $100. Epiphany Diamonique Inscribed Love Ring: This 1.75 carat total weight solitaire style ring features a round center-set CZ set in a cathedral platinum clad Epiphany setting. The ring is accented with smaller, round CZs bead set on either side of the center. The word 'LOVE' is engraved on the inside of the shank. The 'O' in LOVE contains a small CZ in its center. The ring retails for $115.00. Diamonique Solitaire Ring: This 2.00 carat solitaire style ring features a round, center-set CZ in a plain 14k yellow gold setting. The center CZ has 100 facets, which will make it sparkle more than the average 2.00 carat round CZ. It is set in 14k yellow gold. The ring retails for $285.00. These rings only come in whole sizes and resizing a plated ring, as in the case of the gold clad and platinum clad, is not recommended. Available ring sizes run from size 4 to size 10 and must be specified when placing the order. A real diamond is the hardest natural mineral known. A diamond measures 10 on the Moh Scale, which is the scale that measures the hardness (or scratch-resistance) of a gemstone. Only a diamond can scratch a diamond. Diamonique and other cubic zirconias respectably measure 8.5, following sapphires and rubies at 9. However, this is a relative scale not a linear scale; a diamond is actually 4Xs as hard as a sapphire or ruby. A Diamonique ring worn every day (like most engagement rings are) could show wear and tear. Diamonique and other cubic zirconia stones are highly dispersive, meaning they capture light and splits it into dazzling spectral colors. A Diamonique will display more dispersion than a diamond, which has more scintillation or reflective white light. Scintillation (white light flashes) and dispersion (prismatic flashes) contribute to a gemstone's brilliance or sparkle. A gemstone's refractive index measures how a gem refracts the light through it. A diamond's high refractive index means it's virtually unparalleled in brilliance. Diamonique stones simply are not as brilliant as diamonds. This difference in refractive index is clearly evident in larger sized cubic zirconia. The larger area makes it more difficult for the cubic zirconia to adequately refract the light through it and results in less sparkle. Diamonique and other cubic zirconia stones are denser than diamonds. Therefore, a 1 carat CZ will appear larger than a 1 carat diamond. As a result, CZs are usually represented by size in millimeters as comparable to a diamond of similar millimeters. For example, a 1 carat round diamond measures 6.5 millimeters, so a 6.5 millimeter CZ is used as a 1 carat diamond, even though the CZ weighs more than 1 carat. Remember, a Diamonique is imitating a diamond so the face-up appearance takes precedence over the actual weight. A trained professional, a jeweler, and a gemologist will be able to tell that the Diamoniques are not diamonds by using a jeweler's loupe with 10X power magnification or a gemology microscope. Some gemologists may even be able to tell with the unaided eye that it is not a real diamond. When viewed under 10X power magnification, a Diamonique or other CZ will have rounded edges where the flat facet surfaces meet. It will also have a girdle (the outside diameter) that appears to be melted rather than having a crisp outline. A CZ will have no inclusions, or foreign particles, trapped inside it. A CZ will show a doubling feature at each of its facet edges. This is because CZs are doubly refractive and split the light traveling through it into two beams. Diamonds are singly refractive and do not split the light. CZs essentially have no value; the entire value of the ring lies in the metal of which it's made. CZs are far less brilliant than diamonds, especially so when dirty. Many Diamonique rings can't be sized and are only available in whole sizes. People may notice it's not a real diamond. Also, if you are presenting this ring without your intended's input, you will have to tell her she does not have a real diamond. If she takes her ring to a reputable jeweler to have it cleaned, the jeweler will probably inform her that the 'diamond' is not real. A woman informed of this in the middle of a jewelry store is a bad scene. Diamonds are universal symbols of love, but they are definitely not inexpensive. A Diamonique ring might be right for you, but make an informed decision before making your purchase decision. An engagement ring should be personal and special to you both. Just because you can't afford a gigantic center diamond doesn't mean you can't afford to be clever. Diamonique rings are not the only budget-friendly engagement ring alternatives. 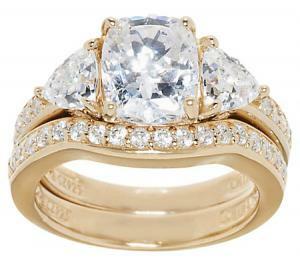 Non-traditional engagement rings are popular, and there are many options. If you are trying to stay on a budget, you may want to try something non-traditional and unique like a ring with a colored gemstone in the center (think Princess Diana/Kate Middleton sapphire). Estate jewelry is also an option. The Diamonique brand is owned by the shopping channel QVC. It is sold exclusively through the QVC shopping channel, although secondhand items may appear through other shops and online auctions such as eBay. QVC sells Diamonique rings and other jewelry with a 30 day money back guarantee. More information is available on the QVC website, including purchase information, how to care for Diamonique rings, and customer service details.